The Forms Tab lists all the forms that you can access from your account, and allows you to perform a variety of form actions. You can create a new form using the New button in the upper right. Forms List: The layout of the forms list and the functionality available there. Individual Form Actions: The actions available via the [...] Actions dropdown menu. Bulk Form Actions: Actions that can be performed on multiple forms at once. Searching and Filtering: How to narrow the list of forms to find what you need. Click the form name to open the form in the Web Form Editor. Click the column header to sort the forms list alphabetically by name. Click it again to toggle between descending and ascending sort order. Click a tag name to filter the forms list so that it displays only forms containing that tag. Owner - The GoFormz user who is the current owner of the form. Last Updated - The date and time when the form was last modified. Click the column header to sort the forms list by date. Click it again to toggle between descending and ascending sort order. Actions - A dropdown containing a menu of actions. See below for more. You can sort the forms list by the Form Name or Last Updated columns. To do so, simply click on those column headers. The Form Name column will sort alphabetically, and the Last Updated column will sort in time order. Clicking the column header a second time will toggle between sorting in ascending and descending order. By default the list is sorted by Last Updated time. The Actions column contains a [...] dropdown menu with a set of available actions for each form. Click on the action name in the list below to learn more about it. 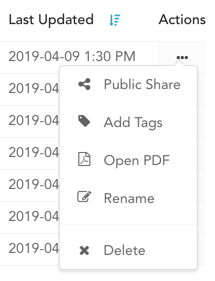 Public Share: Share this form to an external user via a Public Share URL. Add Tags: Add tags to this form, or remove tags from this form. Open PDF: Open a PDF version of this form, or download the PDF to your computer. Location Info (completed forms only): Show a map with a pin indicating where this form was completed (if available). There are three actions that can be performed on multiple forms at once. These actions are Download PDF, Export, and Delete. To do this, check the boxes to the left of the forms on which you want to perform the action. A Bulk Actions dropdown will appear at the top of the page. Expand the dropdown and select the desired action — Delete, Download or Export. The search and filter functionality resides in the header area, as pictured above, which includes the Time Range dropdown, the funnel-shaped Filter button, and the Search Bar. Below is a brief overview of the capabilities. See here for more on searching and filtering forms. The Time Range dropdown lets you filter your forms list by date, using each form’s Last Updated column. The Filter button brings up controls that allow you to filter by form status, form owner, and form tags. The Search Bar lets you search your forms by form name.